If one of the most liberating moments in a writer's life comes with the realisation that lyric poetry allows you to make things up, the true revelation occurs when this deliciously sinful inventiveness delivers, somewhat paradoxically, the most eye‑opening and heartrending truths. 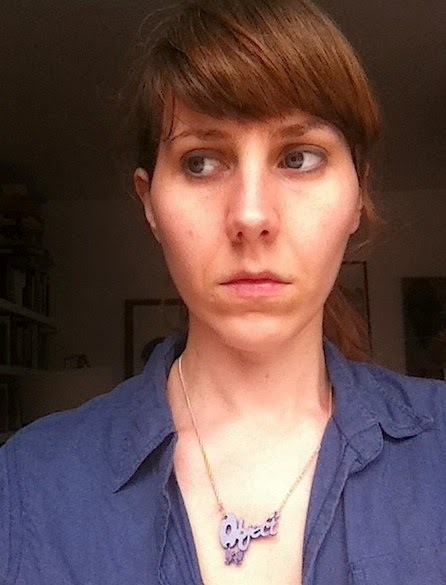 Dear Boy, Emily Berry's first book of poems, is immediately striking for its sophisticated awareness of such artifice. Opening with a darkly comic account of life as a dramatised and scrutinised performance, the collection presents a host of surreally reimagined everyday scenes in which speakers and characters, by turns emotionally, intellectually and physically compromised, perform accepted, expected and imagined roles. "'Time for another / caffeine fix methinks!'" proclaims one, half intent on reinventing herself, before confiding that "I am not allowed coffee / because of my nerves, but the biographer doesn't / know this". 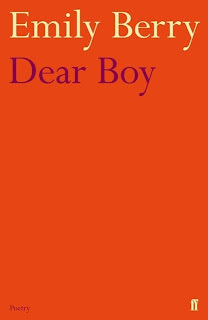 Much of Dear Boy reads as an attempt to map the gaps between who we think we are, how we present ourselves, and who we end up appearing to be. Whether drawing on ostensibly personal material or delving into the depths of her imagination, Berry's big theme is relationships. Patients are found at the mercy of deranged doctors; a confused mother faces a "perpendicular daughter" she is utterly at odds with; a teenage girl allows her boyfriend to squeeze her into ever tighter corsets; and in the haunting "The House by the Railroad", a child trapped in a nightmarish fairytale searches for a parent held perpetually out of reach. Such searing, often painful subject matter makes for a curious mix of deadpan comedy and irony. 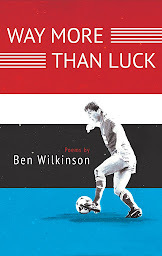 The book's title poem, a playful missive that showcases a good deal of Berry's tonal repertoire, achieves a strangely convincing balance between intimacy and solipsistic extravagance, veering from dismissive jokiness ("I'm not sure if you were there or not. / Did you want to be?") to heartfelt emotion: "I tangled your legs in mine. We were a knot in the grain of the world." Not dissimilarly, "The Way You Do at the End of Plays" frames the tussle between life's everyday froth and those near-indescribable feelings given voice through art in the faintly tragic meeting of two estranged lovers. This ability to make the unspoken precisely and vividly apparent is one of Berry's most striking gifts. Though you find yourself wondering if, at times, telling it quite so slant merely serves to further mask some painful, unavoidable truths. Little is held back, however, in the other letter poems that thread through the collection, charting the anguish, confusion and yearning of a long-distance love affair. These grammatically freewheeling, staccato outpourings, combining persuasive candour with foreboding undercurrents, exhibit Berry's more confessional side, recalling John Berryman, Sylvia Plath and, at times, Sharon Olds. "Letter to Husband" in particular drips with the achingly Plath-like image of a "dark mouth hovering over me", ending on the "desperate / undeviating wish" that the beloved "please come". Elsewhere, sorrow and desire may be tempered and kept in check by life's distractions and a willed lightheartedness, but in bittersweet fashion, the poems find such feelings always return. Even if, as "Love Bird" uncovers, love takes "many shapes"; and even if, as "The Old Fuel" conjures in the perfectly judged metaphor of an "old spaghetti machine", "cranking out oodles of love" can be hard work. Dramatic, honest, unstable and beautiful, what unites these poems is Berry's understanding that absence is to love as wind is to fire: it may extinguish the small, but it kindles the great. 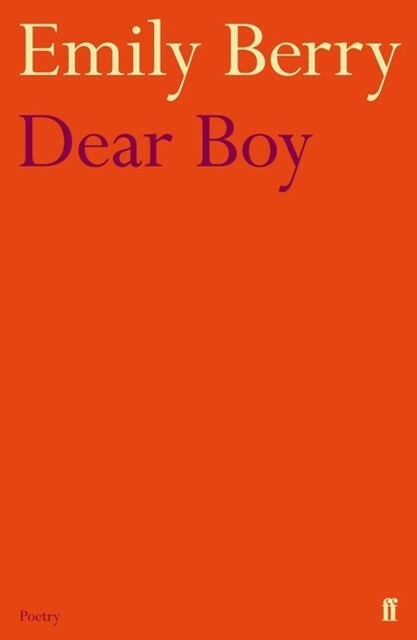 From its most sentimentally intoxicated to its more socially engaged poems, a crucial aspect of Dear Boy's knowing aesthetic is the precise and telling detail. "Plans for a Future Romance" invests a kind of cinematic significance in specific memories of a blue scarf and "text messages about snooker and sleep"; in "The Tea-party Cats", a group of improbably suave yet absurd poseurs preen whiskers that "nicely referenced their bowties". "Nothing Sets My Heart Aflame", a witty lament for the ennui and anxiety that consumer capitalism engenders, even finds the poet musing whether "perhaps there was something missing in your life and it was a mid-century lampshade". For all the archness and cleverness, however, such images betray a serious and incessantly inquiring mind that seeks out epiphanies almost anywhere, analysing feelings, objects and the behaviour of others to the point of paralysing uncertainty. "Does nothing more / detain us", asks the procrastinating speaker of "Preparations for the Journey", "Have we forgotten / nothing?" In a world where you wake to "a bad new government" with "austerity breakfast", harbouring a love-hate relationship with the city you "fell for", it can be easy to imagine the only alternative to the reflective life, as "Devil Music" suggests, is to deny a fundamental part of the self: "I worked. I silenced myself / devotedly until my devil soul twisted / and bucked, and was still." Yet, despite such moments of feverish bleakness, Dear Boy never seems too dejected or wearying, recognising our need to connect, feel and love, however painful the consequences. If anything, its memorable imagery and range of registers, coupled with a formal restlessness that encompasses everything from loose quatrains to tumbling prose poems, make it an unusually animated and refreshing read. Like the skilled ballet dancers in "Thirty-two Fouettés", this noteworthy debut sees Emily Berry making bravura turns again and again, in poems of polished phrase, seductive technique, and, in spite of the smoke and mirrors, genuine feeling. You can find out more about Emily Berry and her work here.